Author MerriePublished on January 1, 2015 Leave a comment on HAPPY NEW YEAR!! It has been awhile since we have visited. My husband and I were able to spend a week with our family in the Dallas, TX area early in December. Our son lives there as well as my brother in law and his family. 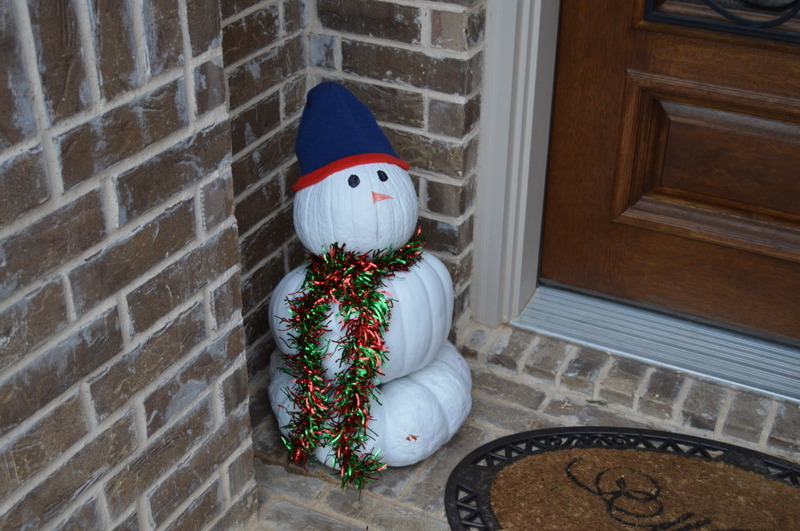 My dear sister in law repurposed her fall pumpkins and turned them into this cute snowman that sat outside their door during the Christmas season. Being gone for a week in December seemed to put me behind in everything for Christmas. Although I had my shopping done before we left, since we celebrated a early Christmas while we were in Texas, there was still so much to do when we got back. We did not put the tree up right after Thanksgiving knowing that the cat might want to climb it while we were away so that still needed to be done. I also do some special cooking for Christmas gifts. I traditionally make what my mother called "Crunchy Confection" which is a jazzed up version of Chex Mix. Besides the Chex cereal there are other cereals and pretzels in it. This mix is put into bags and given to all my coworkers. There are around 40 so I have to make a really big batch. I use both parts of my turkey roaster to bake the mix in. I usually make some fudge also but that just did not happen this year. We ate at a fantastic place called Babe's when we were in Texas. They serve only two things fried chicken or chicken fried steak. With that they serve, family style, creamed corn, salad, mashed potatoes with white gravy and to die for biscuits. They are light and fluffy and delicious with their "Texas Brush" honey. It was great for all nine of us to sit around a round table with a huge lazy susan in the middle with all the food on it. So the biscuits were so good I have been looking for a recipe to try to replicate them. Mine of course will not be quite as light because I will be using whole wheat flour. I found a recipe in Southern Living Magazine called Angel Biscuits and I have a batch going right now. The thing about this recipe is that it has baking powder, baking soda and yeast in it and after mixing they are refrigerated for 2 hours up to 5 days before rolling, folding, rolling then cutting. My dough is in the refrigerator right now so I will be getting them ready to bake shortly. The other secret is that they are baked in a cast iron skillet, which always makes everything taste better. I hope to get a good picture of the results for you. My prayer is that all of you have a happy and blessed 2015. Talk with ya'll soon.